DN : 100 - 400 mm. Flow rate : 90 ~ 2100 m3/hr. Head : 7 ~ 35 m.
power : Up to 145 kw. Feature: Pump was driven by diesel engine via gear box. 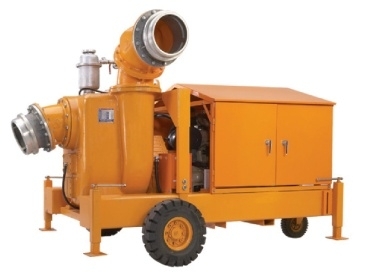 Equipped with non-clog impeller and built in vacuum system. Auto self-priming water without fill water in pump casing by manual.High solids handling and dry-running ability. Compact dimension design for easy to transport and storage. Application: The groundwater control or the basement dewater. The sewage water drainage. Flood waters drainage promptly. Drains off water for ships. Drain off water in the remote suburb. Water control for aqua farm. Draining water at basement.